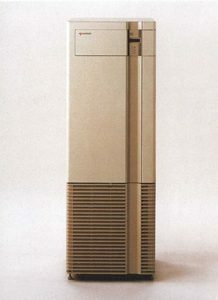 The Tandem CLX was the first Tandem computer system to be implemented with a (mostly) single chip processor. 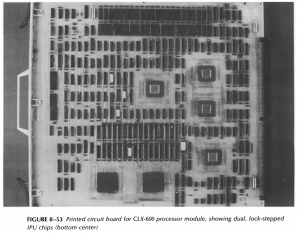 The first of the CLX line, the 600 was implemented in 6 CMOS chips, made by VLSI on a 2u process. They ran at 7.5MHz resulting in about 1MIPS if performance, slower of course the the VLX, but they were designed for value not raw speed. The processor consisted of a pair of identical CPUs, running in lock step, each having 60,000 transistors (81,000 sites), a pair of IPBs (inter-Processor Bus) with 19,000 transistors each, and a I/O Controller and Memory Controller (12,000 and 25,000 transistors each). These processor are micro-coded, with some microcode on chip, and the rest stored off chip. It is this extensive micro-coding that helps the processor make up for some of the performance losses associated with less, and smaller busses then the discrete implementations. The smaller busses do significantly lower costs though (less SRAMs needed, and smaller cheaper packaging for the processor. The processor internally is similar to the VLX design, a pair of 16-bit ALU’s are used to implement 32-bit addresses. There is 160 54-bit words of microcode on-chip, which stores a subset of the off chip microcode. Off chip microcode is loaded into 30 16kx4 35ns SRAM chips, providing 14k words of microcode, 2k words of page table cache and 16k words of instruction/data (shared) L1 cache. 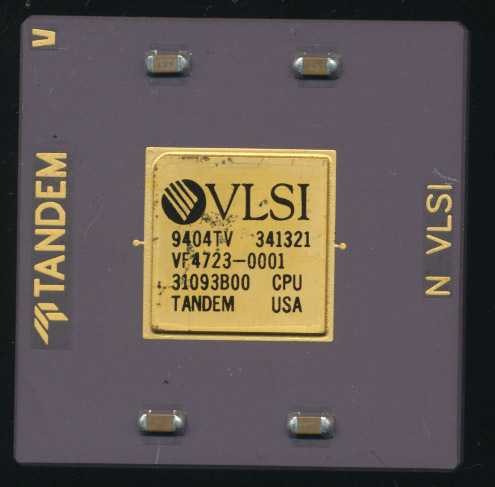 In 1989 the CLX processor was redesigned for VLSI’s 1.5u process, resulting in the CLX700. THis increased the clock speed to about 11MHz providing 1.5MIPS of performance. 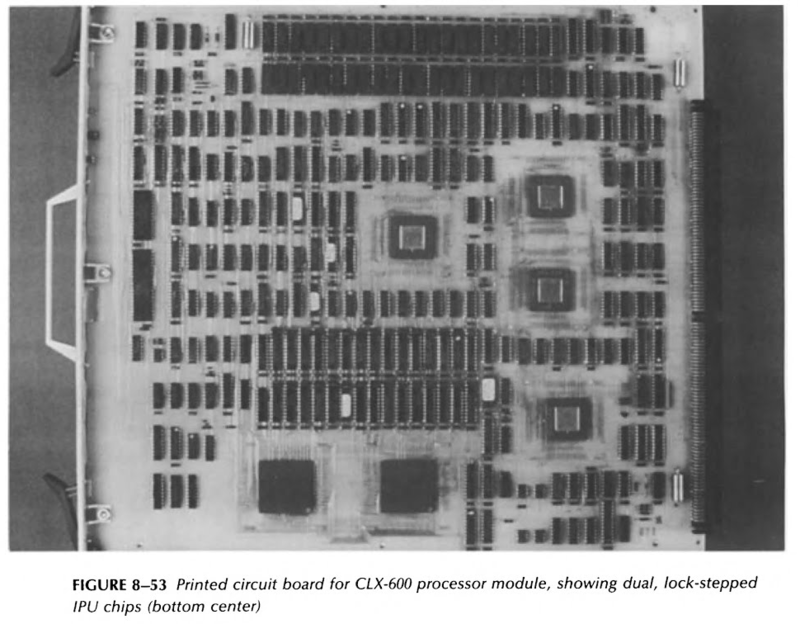 The CLX800, released in 1991 was another performance improvement, again realized by a process shrink at VLSI. The CLX800s processor was now made on a 1u CMOS process at a clock speed of 16MHz. This resulted in the lower end CLX line performing at 2.2MIPS, nearly as fast as the original high end VLX. The CLX800 and the high end Cyclone (ECL gate array based, 10MIPS) were the very last of the the original Tandem architectures. 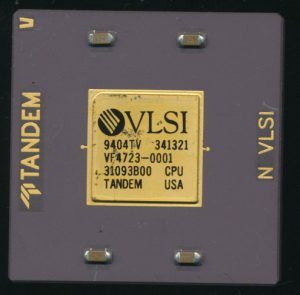 Tandem moved to MIPS based systems in the 1990’s. In 1997 they were purchased by Compaq, which was then merged with HP in 2002. Interestingly, this brough Tandem computers, which was started by former HP employees, back to HP 28 years later. As part of HP (now HP Enterprise) Tandem computers were moved to Itanium processors, and later x86 processors in 2014. The original TNS kernel was simply ported over, old code translated or recompiled (in the case of MIPS compiled code). Tandem continues to provide fault tolerant computing to customers around the world.